The United States sees the ASEAN and India as two of the strongest pillars of the global economies in the 21st century. And most importantly, US and Indian citizens will benefit from the ties, Mr. Hormats said. 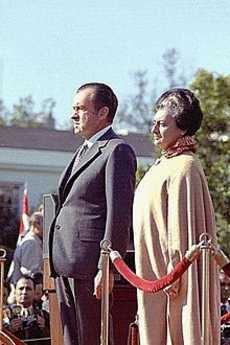 President Richard Nixon and Prime Minister of India Indira Gandhi in 1971. They had a deep personal antipathy that colored bilateral relations. Prime Minister Singh concurrently established the National Innovation Council to create policies that support medium-to-long term innovation in India. According to Mr. Hormats, the US is also encouraging the Indian government and all of its trading partners to consider a range of market-based solutions that can better support jobs and growth, while creating a level playing field. He says predictable and clear policies will encourage businesses to expand, and to devote the long-term capital and resources required for further growth. Working together, the United States and India can realize the kind of innovation our leaders envision, Mr. Hormats stated. Science, technology, and the environment are areas characterized by mutual interest and expanding cooperation, he added. US-India collaborative effort in agriculture includes efforts to stop food loss between the farmer and the consumer, increasing prosperity for both. On the investment side, Mr. Hormats cites the U.S. and Indian governments have engaged in Bilateral Investment Treaty (BIT) negotiations. Both countries are aiming for a BIT that gives a high level of openness to investment across the economy, provides strong rules on investor protection and transparency, and offers effective means for resolving investment disputes. Mr. Hormats reports that the Clean Energy Finance Center in New Delhi represents U.S. agencies that have mobilized more than $1.7 billion for clean energy projects in India, working in tandem with Indian government and industry partners. He points out this dialogue takes on even more importance with the growing role of the Indian Ocean in global energy shipments, regional energy and maritime security, growing power needs, and sustainable clean energy objectives. Both countries seek a broader and deeper dialogue on energy, for similar reasons, with countries in south and east Asia. Mr. Hormats stresses the American energy boom as a reason to pull back from engagement, but as an opportunity to expand mutually beneficial engagement. In addition to business connections, people to people connections are one of US-India strongest links, he added. He cites that more than 12,000 American alumni of Indian institutions are part of our efforts to strengthen and broaden relations with India. According to Mr. Hormats, there are more than three million Indian-Americans living in the United States. In 2012, And last year, over 100,000 Indian students came to the U.S. to study. With the increasing connectivity of both countries’ universities, businesses, and civil societies, the world is seeing more engagement than ever. Mr. Hormats underlines the partnership is creating the next generation, and a deeper level, of economic diplomacy. He says more and more international economic diplomacy will be the work of mayors, governors, chief ministers and their teams. While in Agram, Mr. Hormats discusses also the role industrialized countries and emerging economies can play together in the rapidly changing global economic order. Mr. Hormats believes nations like US can seize this opportunity to develop new sets of cooperative relations with emerging economies to increase trade, encourage closer cultural ties, boost energy production and reliability, address environmental challenges, and improve global stability. The US seeks new partnerships to address the needs of the 21st century. He emphasizes that the depth and breadth of U.S.-India ties make this relationship a model for discussing Global Partnerships for Enduring Growth. He highlighted that both states and cities of the two of countires are the real laboratory test tubes of democracy and creative economic policy where their citizens are in close and direct contact with their local governments, where their entrepreneurs establish and develop new business that drive employment, and where their institutions of higher education help them all enhance their skills and retrain for new opportunities. Mr. Hormats adds the robust connections between Indian and American states and cities are a welcome commercial development, and offer both countries more ways to take the strategic partnership to an even more ambitious level. In october 2012, stressing the importance of US-India relationship in the 21st century, the United states announced that its boosting its efforts to strengthen its strategic cooperation with India. India’s recent economic rise has expanded its role and deepened its stake in shaping the international system, the US is counting on India’s rise as a truly global power – one that looks east and west, a strategic partner for economic growth, security, and the provision of public goods. And as the world’s economic and strategic center of gravity shifts east, the United States is not the only nation emphasizing its role as a resident diplomatic, economic and military power in the Asia-Pacific. India and the United States have a powerful and shared interest in an Asia-Pacific where economic interdependence drives growth and shared prosperity. In addition, India is revitalizing centuries-old commercial ties with countries to its east and making headway on an Indo-Pacific corridor through Bangladesh and Burma that connects South and Southeast Asia. Both the United States and India have a strong interest in a peaceful, stable future for Afghanistan. India has committed more than $2 billion in development assistance to Afghanistan since 2001, building on ties that go back to the early Indus Valley civilizations. Deeper defense and security ties have become another leading indicator of a burgeoning strategic partnership. As India’s military influence grows, US hopes that its partnership can become one of its closest in the region. Since Secretary Clinton hosted Minister Krishna in Washington in June for the third U.S.-India Strategic Dialogue, the interaction between the two governments has continued to deepen and expand. Strong support across the political spectrum in the United States, as well as in India, gives us reason for continued optimism about the bilateral relationship in the years ahead. The US considers India a model of democratic governance, tolerance and rule of law, that can play a critical role throughout the Middle East and North Africa, as well as East Asia, to support the strengthening of democratic institutions, civil society, education, and many other fields.